The name means "Snowflakes", so called because the tea leaves resemble snowflakes falling from the sky when infused. Tea connoisseurs typically do not like jasmine scented teas as they are usually made from low quality tea leaves. Snowflakes is an exception. This rare jasmine-scented tea is produced from the finest quality Green tea leaves from Sichuan province of China. Recommended to all Green tea lovers and a must try if you like jasmine-scented teas. Even the dried leaves have a lovely jasmine fragrance. The liqour taste of sweet jasmine with a hint of vanilla note. This tea serves well cold or hot. 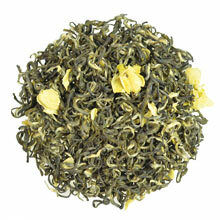 Twisted young and tender tea bud and leaves with jasmine petals.